(Jan. 10, 2019) -- Conference USA announced its 2019 football schedule today and UTSA will play eight league games, four at home and four on the road, as part of a 12-game regular season slate this fall. 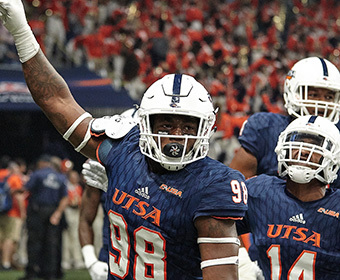 >> View the 2019 UTSA Football schedule. The Roadrunners will kick off their ninth season of play on Saturday, Aug. 31, at the Alamodome when they face crosstown opponent Incarnate Word for the first time. UTSA then will travel to Waco, Texas, on Sept. 7 to face Baylor for the third straight season. The Roadrunners scored their first win against a team from a Power 5 Conference with a 17-10 triumph over the Bears at McLane Stadium in 2017. The Roadrunners will welcome another first-time foe to the Alamodome when Army West Point, which finished the 2018 season ranked 19th nationally, comes to town on Sept. 14. UTSA will open its seventh season of C-USA play on Saturday, Sept. 21, when they travel to Denton to face North Texas. The game will mark the seventh meeting between the two teams in a series that is tied at 3-3. After their first of two bye weeks — a first for the program since the 2014 campaign — the Roadrunners will travel to El Paso for a matchup with UTEP on Saturday, Oct. 5. UTSA has won two straight games against the Miners and leads the series, 4-2. The Roadrunners return to the Alamo City to host back-to-back home games against UAB on Oct. 12 and Rice on Oct. 19. The defending C-USA West Division champion Blazers hold a 2-1 edge against UTSA, while the Roadrunners have won four straight against the Owls and lead that all-time series, 4-3. Following the second bye week of the fall, UTSA will step out of league play and make its second-ever trip to College Station to play Texas A&M, which ended the 2018 season ranked No. 16, on Saturday, Nov. 2. The Aggies scored a 23-10 win in the inaugural matchup in 2016. The following weekend will mark the Roadrunners’ first trip outside the state of Texas when they travel to Norfolk, Va., to face Old Dominion for the third time on Nov. 9. UTSA will close out its home slate by hosting Southern Miss and Florida Atlantic on Nov. 16 and Nov. 23. The Roadrunners will meet the Golden Eagles for the sixth time in a series led by USM, 3-2, while UTSA will face the East Division’s Owls for just the second time in the home finale. The regular season will conclude on Nov. 30 with a visit to Ruston, La., to play Louisiana Tech for the eighth time, matching Rice as the most-common opponent in program history. The 2019 campaign is a 14-week playing season, beginning the weekend of Aug. 31 and ending Nov. 30. The league’s 15th annual Championship Game will be played on Saturday, Dec. 7. All games are subject to date changes and some dates are expected to move in the coming weeks in order to accommodate national television. A schedule of televised games will be released at a later date. View the 2019 UTSA Football schedule.